Have you ever been watching a training video and wondered what program it was? Well, now we know! The Weikart Center reached out looking for programs who would be willing to be filmed. Two of our partners, Conservation Corps and Keystone Community Service, were selected for the filming. Learn more about the process and keep your eye out for Conservation Corps and Keystone Community Services at your next training. Check out the full piece! We're rolling out our new Program Finder! There's a new mapping system and easier search function. 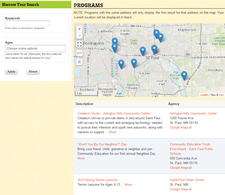 We have over 1,400 programs in St. Paul for people to search through. 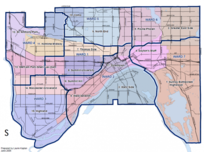 And it's the only place to find Saint Paul Parks and Recreation and Saint Paul Public Schools Community Education, and Saint Paul Public Library all in one place! Find a program and get engaged! The Mayor of St. Paul gave his 11th State of the City address and as he's done in the past, he tipped his cap to Sprockets. Mentioning efforts to tackle inequities in the city, he featured Sprockets, our database and field building efforts. He also mentioned Saint Paul Promise Neighborhood and Right Track while talking about equity. Mayor Coleman has been a great leader for out-of-school time locally and nationally. Check out the State of the City. Quality youth programs are the intersection of quality program features, engaged youth, and youthworker expertise. Professional development opportunities brought to you through our network partners are designed to support these three elements. Register for upcoming professional development opportunities. Are you maximizing the power of play in your program to create safe, fun and healthy experiences for youth every day? This hands-on workshop will introduce you to turn-key strategies and skills that tap into the transformative power of play. This training is highly interactive, be ready to move and laugh, a lot! Following rules, engaging in safe and positive play, and transitioning smoothly from activity to activity can be fun! This hands-on workshop will focus on the essentials of play leadership and provide simple strategies that can be used to build a positive group rapport and climate. Make sure to wear your sneakers and get ready to jump in the game and practice new ways to engage through play. Check out more professional development opportunities on our website including new Social Emotional Learning trainings through the University of Minnesota! Join one of our Neighborhood Network Teams and help young people be successful through quality out-of-school time experiences!